On the way to Costco yesterday to pick up a load of stuff for today's church coffee hour, the Mrs. Bird Dog and I were discussing C.S. Lewis' notion of "the shadow of God" - the indirect manifestations of God's presence in our world. I was thinking that it is similar to Plato's analogy of the cave, but Mrs. BD thought that the recent proofs of the abundance of dark matter in the universe - discoverable only through its effects on other things but not directly knowable�- was a better image. ...This is again why we should value good character over intelligence, since good character implies a kind of intelligence that is faithful to the transcendent object of human existence, whereas intelligence alone assures no such concordance. The former implies "cardiac comprehension," or intellection, which transcends mere mental knowing. And as we mentioned yesterday, a truly intelligent person is a humble person, since he does not fundamentally seek recognition but transcendence: "he is interested in surpassing himself; hence in pleasing God more than men" (Schuon). ...Polanyi has written extensively of how the intellectually gifted scientist (as opposed to the typical "worker bee" scientific laborer) employs a kind of translogical vision in order to identify a fruitful problem that will then be susceptible to conventional reasoning. But this vision can never be reduced to some mechanical or deterministic rational formula (any more than great songwriting can be reduced to knowledge of musical scales). Rather, it is much more analogous to artistic vision, to a sort of holistic seeing, than to scientific reason. It is a kind of "seeing within," or into the "withinness of things." It is what Einstein meant when he said that he wanted to understand the mind of God. 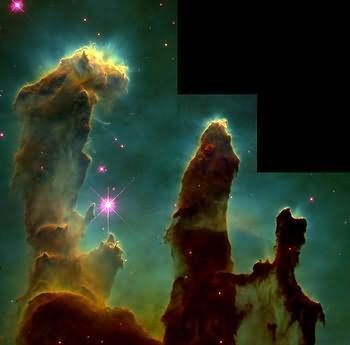 Photo: Hubble image of gas pillars in the star-formation region of the Eagle nebula. How trivial are our daily concerns? "...a truly intelligent person is a humble person, since he does not fundamentally seek recognition but transcendence: "he is interested in surpassing himself; hence in pleasing God more than men"
I read the whole article and this line in particular I had to read several times. I don't get it. I think what's giving me trouble is that he implies a non-believer cannot be intelligent. Being neither theologian nor expert thinker about such things, my sense of it is this: There are several intelligences, (two, he says, to keep it simple) and the non-mundane intelligence seeks God ie the transcendant in addition to earthly ("animal") intelligence. That non-mundane intelligence he refers to, in my opinion, is the intelligence of a child, or an Einstein. Read the guy: he makes a major distinction between life in the horizontal and life in the vertical. Is life in the horizontal like when you're supine in front of the tube or in bed? I think he talks nonsense so I can't read a lot of him. He wrote that particular hoo-ha to 'get' one of his commenters. I noticed he goes to a lot of trouble to do this when a commenter offers an opposing viewpoint to some of his windy statements. "But why can Coondog's intelligence never know truth? Yesterday a commenter who is himself brimming with rudimentary intelligence took issue with my statement that "either natural selection explains our intelligence, or our intelligence explains natural selection. You can't have it both ways." Instead, the commenter declared that "natural selection is the cause of our intelligence; in turn, our intelligence provides the written and/or verbal explanation of natural selection. Problem solved; now we have it both ways." The tail-chasing circularity of this dogomatic barkument should be evident to all coonines. It is logically equivalent to saying that truth and intelligence do not exist, since they may be reduced to blind natural selection. With such a view, there is not even an ontological basis to draw a fundamental distinction between animal and human intelligence, much less between the evolved brain and the uncreated intellect." That makes no sense. The commenter is correct. Besides, truth is truth no matter what kind of dogomatic barkument you spew. "The truth is true whether you want to believe it or not...it doesn't need you to make it true. That lie about everyone having their own truth inside of them has done a lot of damage and made people crazy." "...This is again why we should value good character over intelligence, since good character implies a kind of intelligence that is faithful to the transcendent object of human existence, whereas intelligence alone assures no such concordance. " Hunh? You can't have both good character and intelligence and not be 'faithful to the transcendent object of human existence'? What's that? All of us have souls. Does that count? What's up with this new Humility line of undergarment you've been parading about in lately, Bob? Have you actually had some...personal growth? Personally I think it looks -and sounds- good on you. You have it slightly backwards, for if what you are saying were true, it would mean that you had outgrown something I sense you haven't. Thank you, Bob (Dylan). I am now crazy. 1. How you raise your children. If you teach them to love themselves they will be able to love and to do good things. And they will teach their children to love themselves ... and pass on a legacy of kindness and good works to others. 2. When you are kind to a stranger I think God is guiding your actions. One Cosmos isn't everbody's cup of tea. I get a kick out of him, but I am careful to only check him out once a week. Does that mean I have outgrown something you sense I haven't? I will agree, if you would only pass the Maker's Mark this way. Oh, fiddle dee dee. Have some of my Canadian Mist. I learnt to drink it in collidge. One acquires a taste for it after the first sip turns your taste buds into sullen nubs of imbibediness.